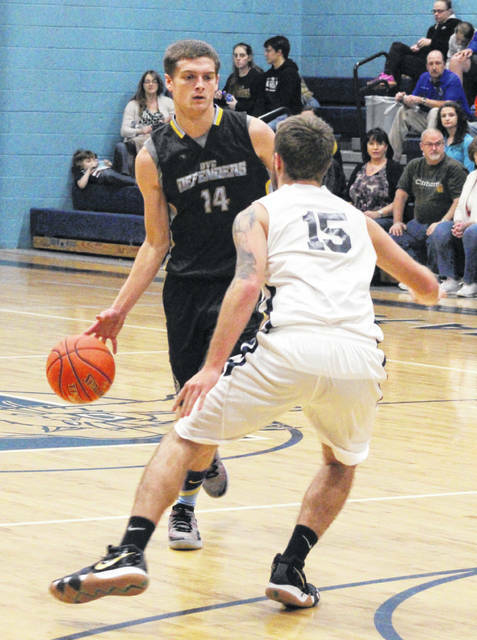 Hannan senior Dalton Coleman (13) and Ohio Valley Christian senior Justin Beaver (14) both reached the 1,000-point career plateau on Friday night during the Wildcats’ 65-47 victory over the Defenders in a non-conference matchup in Ashton, W.Va. Joining the record-setting duo are HHS coach Shawn Coleman, left, and OVCS coach Steve Rice. OVCS senior Justin Beaver (14) dribbles the ball down court during the first half of Friday night’s non-conference boys basketball contest against Hannan in Ashton, W.Va.
ASHTON, W.Va. — A win-win situation from a win-lose scenario. 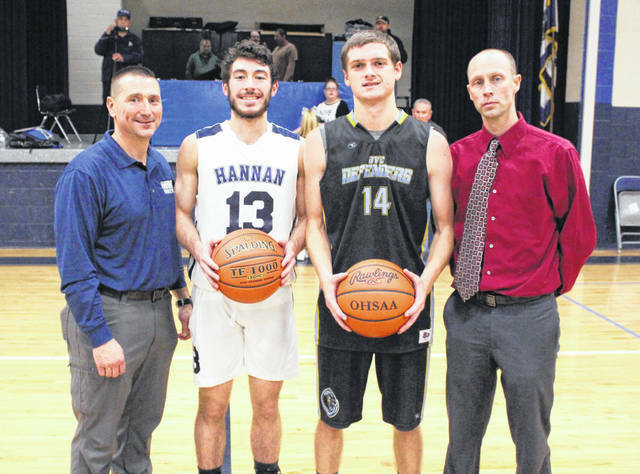 Hannan senior Dalton Coleman and Ohio Valley Christian senior Justin Beaver both reached the 1,000-point career plateau during a 65-47 Hannan victory in a non-conference boys basketball contest Friday night in Mason County. Both seniors accomplished the career feat during a pivotal third quarter that saw the host Wildcats (1-1) turn a 10-point halftime cushion into a sizable 50-27 advantage headed into the fourth. Beaver’s big moment came at the 3:03 mark as the senior hit a step-back 3-pointer from the right wing for a 45-26 deficit, making Beaver the ninth boy in OVCS history to reach quadruple digits in a career. A little over a minute later — at the 1:41 mark to be exact — Coleman hit his milestone on an 18-foot jumper from the right elbow, allowing Hannan to increase its lead out to 50-27 before entering the finale. Coleman — who entered the night needing 25 points to reach the 1,000 mark — scored 13 points during that 21-8 third quarter surge, and became the eighth Wildcat in school history to reach quadruple digits in the process. The Defenders (1-5) never led in the contest and trailed for all but 35 seconds in regulation. Coleman broke a 2-all tie with a jumper at the 6:03 mark that gave HHS a permanent lead at 4-2 en route to a 19-8 first quarter advantage. A pair of Beaver free throws capped an 8-2 run to start the second frame, making it a 21-16 contest with 5:09 remaining in the half. The guests, however, were never closer as Hannan closed the half on an 8-3 run to secure a 29-19 cushion at the break. The Wildcats — who owned a 26-15 rebounding edge at the break, including a 13-9 lead on the offensive boards — hit five of their first ten shot attempts and 10-of-17 overall during that pivotal 21-8 third quarter surge. OVCS was never closer than 10 points in the second half and came no closer in the fourth than 58-43 with 3:05 left. Hannan led by as many as 25 points (52-27) with 6:27 remaining in regulation. The win was the first for new HHS coach Shawn Coleman, who coincidentally became one of the proudest papas in the building on Friday night after having his son Dalton join a pretty elite group of players in Wildcat history. In discussing the milestone, the younger Coleman was very humble about his accomplishment. And, as he noted, he was also very proud that it came in a victory — particularly his father’s first. Conversely, Beaver acknowledged the disappointment in reaching a personal milestone in defeat … but the senior was still upbeat in discussing a boyhood dream coming true. Beaver — the fourth member of Ohio Valley Christian’s 2015 OCSAA state championship team to reach quadruple digits in a career — is also ready to move on to the rest of the regular season. The Wildcats outrebounded OVCS by a 51-38 overall margin, including a slim 20-19 edge on the offensive glass. Both teams committed 21 turnovers apiece in the contest. The hosts connected on 28-of-76 field goal attempts for 37 percent, which included a 3-of-25 effort from behind the arc for 12 percent. Coleman led Hannan with a game-high 25 points, followed by Chandler Starkey with eight points. Logan Barker and Casey Lowery were next with seven points apiece, while Andrew Gillispie added six markers. Matthew Qualls and Devrick Burris were next with four points apiece, while Chase Nelson and Issac Colecchia completed the winning tally with two markers each. Coleman and Lowery paced the hosts with eight rebounds apiece, while Gillispie and Nelson hauled in seven caroms each. The Defenders netted 18-of-62 shot attempts for 29 percent, including a 2-of-19 effort from behind the arc for 11 percent. Beaver led the guests with 20 points, followed by Mark Oliver with a double-double effort of 17 points and 20 rebounds. Bryce Gruber was next with five points, with Joel Daugherty and Conner Walter each chipping in two points. Jeremiah Swab completed the OVCS tally with one point. Beaver and Maciah Swab also hauled in six rebounds apiece in the setback.